~Creates smaller atmospheric mesoscale regions susceptible to migrate along the real polar vortex waves. historically not a frequent event. There seems to be a disconnect between a warmer Arctic and regionally small extreme cold weather. The concept most TV weather spoke persons never talk about is the concept of isolated coldest atmospheres affecting regions not accustomed. There are 2 at present, one in Siberia, the other over North Eastern North America, both have weaker winds at 250 mb Center. The jet stream usually sits next to where the coldest atmosphere exists, if the size of the coldest air extent diminishes the jet bends more and is less expanded towards the equator. CTNP's in black rotate counterclockwise. The bigger Cold temperature North Pole cell is over Siberia, which injects cold air west of the Urals. The North American Cell is way smaller and will not last. Count the calories, Arctic sea ice needs a heat diet. NOAA recalculation to the right shows the outline of older multiyear ice for December 2013. Here is proof in the effects of sea ice thickness on climate. In December1981 there was far less radiation escaping to space compared to 2013. Roughly 20 watts/m2. This necessarily means thinner ice has an impact in profound ways, the buildup of winter, how big it becomes, how long it lasts, depends on how cold the Arctic and Sub-Arctic surface areas become. A prolonged cold period permeating a huge area of the Earth defines the winter bitter, too long, miserable. From the onset of a greater sea ice melt at minima, the world wide dark season becomes automatically warmer, shorter, less expansive, even with ideal conditions of thermal radiation cooling to space, the thinner than multi-year new ice warms the atmosphere, not only by thermal radiation from the sea, but because of its fragile state, creating more leads, venting moisture and gases to the atmosphere throughout the winter, as opposed to a period called spring "break up", when vast amounts of organic and inorganic gases, naturally trapped under the ocean for many months, gets unleashed with great amounts of water vapour, at about Mid-April onwards, when lower clouds and ice crystals overtook the sky. This eruption from the sea protected sea ice further by reflecting resurgent sun rays to space. For about a decade, this happened a lot less, while during these last 10 years or so the process of all winter venting did the opposite, it clouds the Arctic further during the dark season, deflecting radiation usually heading to space back to the sea ice. The OLR chart is worse than it seems, a lot more of thermal radiation returns to surface. Thus from darkness a warmer Arctic is seen on historic charts. The larger dark blue average temperature covering the Arctic Ocean was about 242.5 K, or -31 C.
That is the average temperature of sea ice surface for December 1981. The larger light blue for December 2013 is a mean temperature at about 247.5 K a full 5 degrees Centigrade above 1981. The main obvious question to ask is how this temperature increase affect the entire Arctic? The immediate weather related answer is that there are lesser or weaker thermal inversions at the surface to air interface. These inversions are complex, but heat essentially renders them more scarce, this has huge implications with Anticyclone Genesis. What makes a High Pressure is descending air spreading outwards to a Cyclone. During the Long sunless Polar regions this air circulation favors a cooling process, air skims the risen to surface permafrost and it cools on its way to the Cyclones. Very cold air has much more stable properties than warmer, the cooler air has long shed its moisture , giving a negative feedback, the air freezes further by radiation escaping to space decreasing temperatures further. Multiple thermal layer layers are created one on top of each other, the coldest in bottom warming above. 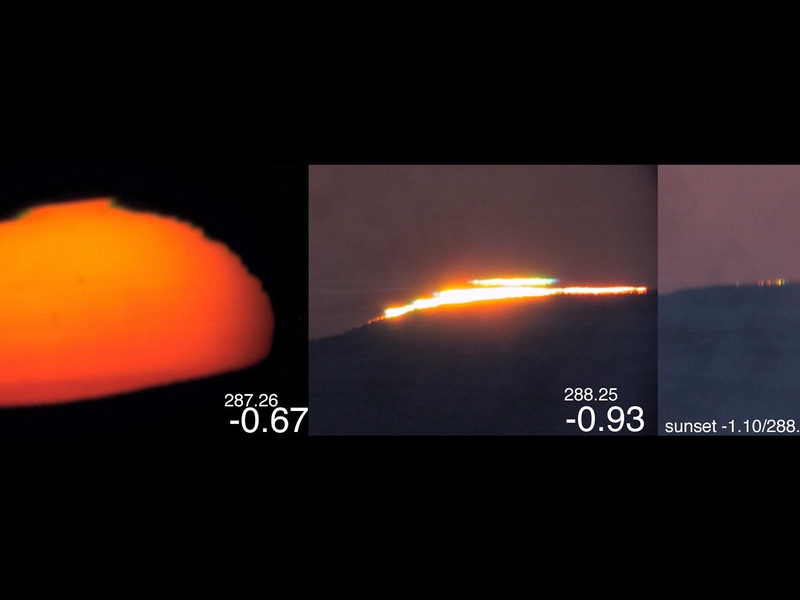 top of the hill captured a magnificent green flash, along with bent layering features. Although distortions caused by by boundary layers still persist, as this March 24 2012 demonstrates. However, sunsets are gradually moving Southwards, the sun is seen more rounder southern like earlier in the year, the effect of thinner ice is also seen by the shifting horizon as well. This awaits another presentation. Warming off the ground changes the sunset, the sun looks rounder, the layering vanishes. Land and seas capable once of fostering great anticyclones transform to cyclone bearing zones. April 28, 2013. "A polar vortex (also known as mignogno cyclones, polar vortices, Arctic cyclones, sub-polar cyclones, and the circumpolar whirl) is a persistent, large-scale cyclone located near one or both of a planet's geographical poles. " Well the North Pole is not in Minnesota USA. Unless there was a huge geographical shift. "The Arctic vortex has two centres, one near Baffin Island and the other over northeast Siberia. In the southern hemisphere, it tends to be located near the edge of the Ross ice shelf near 160 west longitude.When the polar vortex is strong, the Westerlies increase in strength"
So the current US weather is not a polar vortex, but something rather more exotic, more a propos to a lesser worldwide winter days when the jet stream gyrates weirder than usual, it has more to do with the snow laden ground night sky being clear and the day time with fewer sun hours, it is the Cold Temperature North Pole (CTNP) . Definition of CTNP: Center of the coldest place on Earth. It is usually one area emerging from a synergistic effect which is the culmination of the lost of heat to space, it is not North or South Pole Centric. But may have secondary, isolated spots. The circulation around a CTNP is counterclockwise. a US 700 mb map, the center of the 2nd coldest measured atmosphere in the world is over Illinois! @ -33.6 C #2 CTNP. Ust-Barguzin Siberia has the coldest # 1 CTNP cell at -34.9 C.
While the Wikipedia cited Baffin Island "vortex " is CTNP3 #3 coldest. CTNP's further to the South do not last long, disappear rather quickly. While Arctic CTNP's last longest, sometimes months. But the reason why central North America is cold today was because a few days ago there was another CTNP over Southern Quebec, which drew colder air southwards to its West. Warmer air and cyclones were drawn in to its North . The Southern Quebec CTNP warmed substantially and is well over Newfoundland on 6 January 2014. WD 6 Jan 2014.